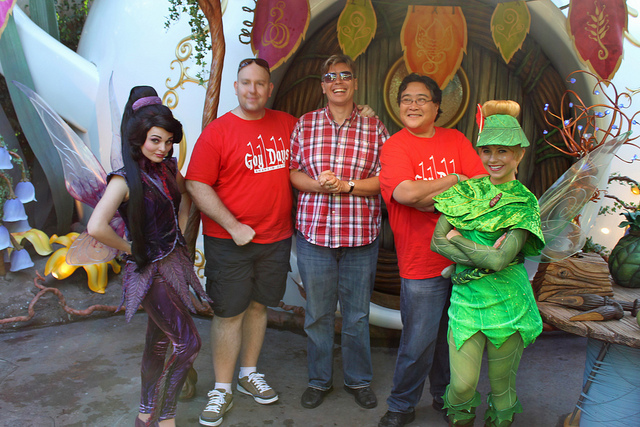 Disneyland tourists posing in red “Gay Days” shirts. Photo credit: Loren Javier via Flickr Creative Commons. If you’re at Disneyland and the park seems unnaturally crowded—and you find yourself surrounded by red shirts—relax. It’s not a gang thing or a convention of unlucky Star Trek characters. It’s Gay Days. Gay Days is the largest unofficial event at the U.S. Disney resorts. Launched in 1991 by a group of LGBT friends at Walt Disney World in Florida, it has grown over the intervening decades into a park-dominating weekend-long Pride party. In June of 2017, there were an estimated 200,000 park attendees specifically participating in Gay Days. The red shirts might require some explaining. Those first queer attendees wanted a way to pick each other out, but a discreet one. So they opted out of the already queer-associated rainbows and chose simple red. Most attendees are simply there to enjoy the parks in like company, and many people are unaware that the event is organized at all. It’s not officially acknowledged by Disney, but the park certainly knows it’s there. Gay Days creative director, Steve Erics, is one of the liaisons with the parks, and there are meet-ups and events in the areas and hotels surrounding the resorts. Pageants, pool parties, and competitions of a variety of styles will happen all weekend, with varying levels of family-friendly or adult fun. While there hasn’t ever been a mention of the event on any official Disney announcement or advertisement, they do participate in their own way. Shops rotate all of their rainbow and glittery merchandise to the most visible locations. The rainbow-sprinkled caramel apples are all you can find. And now in 2018, they are at last releasing their first rainbow Mickey-Ears, featuring two gloved hands framing a rainbow heart instead of the traditional logo. It’s a very capitalist sort of tacit approval, but it’s creeping in the right direction.